Unsure of which QuickBooks 1099 forms – MISC tax form kit to purchase? Call us at (800) 216-0763 and talk to one of our expert advisors to determine the right kit for you. What is a 1099 MISC tax form? Form 1099 MISC is an Internal Revenue Service (IRS) form used in the United States to report non-employee income. Who needs to file a 1099 MISC tax form? Also, a business would need to report if at least $10 in royalties or broker payments in lieu of dividends or tax-exempt interest. 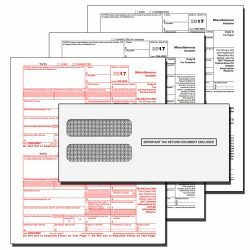 Each vendor gets copies of these 1099 MISC tax forms to submit to the IRS and if a 4 part form is ordered, a copy is sent to the state. There is also a QuickBooks 1099 form copy for the vendor which is required to be mailed to the vendor by the deadline of January 31st each year. There are penalties for being late so be sure to mail timely. Mailing early will give the vendor time to review and call you if there are any discrepancies which are easily corrected if done before mailing to the IRS or State. With the QuickBooks 1099 Form copy A you must send a 1096 Transmittal form the 1099 MISC tax forms. If you have more than 250 vendors that you are sending 1099s to, you must file with the IRS electronically. Buy a 3-Part 1099 MISC tax form if your business is located in one of these states because the state does not require an additional copy of the 1099 form. 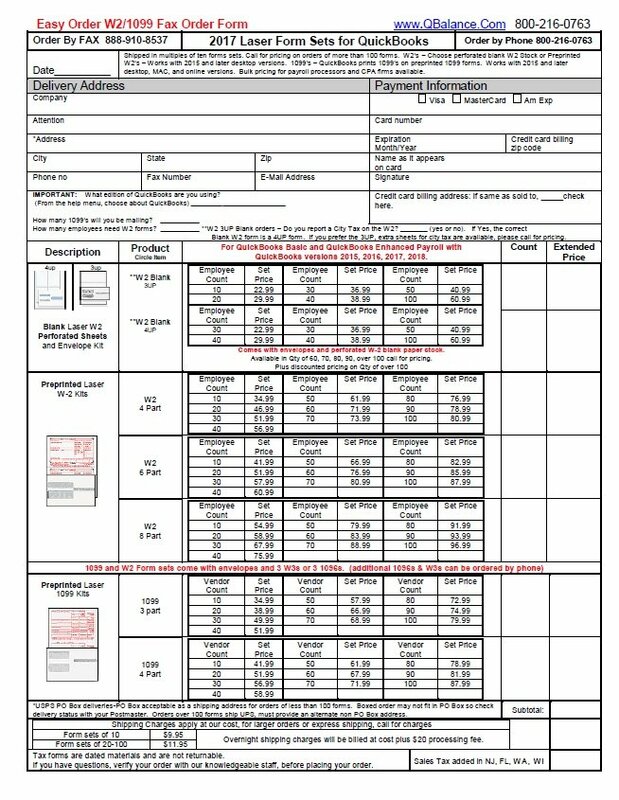 Customer orders under 100 forms shipped priority mail (delivers to most locations within 2-3 days). Otherwise, orders over 100 forms are shipped UPS. Need it faster? Call in and ask about expedited services. Call now at 800-216-0763, if you prefer to talk to one of our Advisors, to determine which kit is best for you. All 1099 MISC tax form kits are dated material and, therefore, non-returnable. Our QuickBooks 1099 MISC Tax Form Kits work with QuickBooks Desktop Pro/Premier/Enterprise, QuickBooks Online and QuickBooks Mac for years 2018, 2017, 2016, 2015. 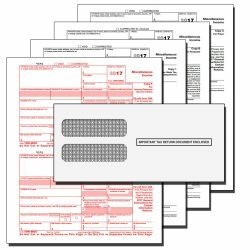 These 1099 MISC tax forms kits purchased from QBalance are QuickBooks compatible and IRS approved. QuickBooks 1099 MISC Tax Forms work with any laser or ink jet printer. Get your free 1099 Guide when you purchase your QuickBooks 1099 Tax Form Kit. Our free guide gives step by step instructions on everything you need to know on completing your 1099s. You will need a 3-Part 1099 Tax Form kit if your business is in a state that only needs to report Federal non-employee income. Envelopes, forms and 3 1096 forms for the number of vendors 1099s purchased. You will need a 4-Part 1099 Tax Form kit if your business is in a state that needs to report Federal and State non-employee income. Why buy your QuickBooks 1099 MISC Tax Form Kit from QBalance.com? You will be taken step by step on end of year processing of your 1099 Misc tax forms when you receive our 1099 tax form guide. Our instructions include useful information on independent contractors, W9 Request for Taxpayer Identification number and certification form, links to important IRS publications for 1099 preparation, step by step instructions for completing your 1099’s in QuickBooks. We give you everything you need to determine who should receive a 1099, how to print the 1099 in QuickBooks, when and where to file your 1099s with the IRS Service Center, how to apply for an extension and how to make 1099 corrections. If you still need someone on one help with this process, call us to learn about our support pricing and schedule a support appointment to have one of our QuickBooks Pro Advisors work with you. Our forms are guaranteed to work as described on this website. If you need help troubleshooting, give us a call at (800) 216-0763. If the problem is due to necessary payroll corrections, our advisor can help you get that fixed for a low rate. If it’s training you need, we have a package that will meet your needs and relieve your anxiety. Here at QBalance as payroll experts, we’ve got your back. Order through our easy to use Fax Order Form, give us a call, or click Buy Now below to order online. Learn who is eligible for a 1099 MISC and how to print them using QuickBooks Desktop. A step-by-step guide to printing 1099 MISC forms using QuickBooks Online. How to fill out the W-9 form and what tax information to give vendors.